As shown in the figures, our recent study has realized significantly-fine theoretical spectroscopy which highly resemble to the experimental one. In addition, our method is able to predict the structure of molecules in their excited state. The scope of the application has been broadened to core-electron processes and metal surfaces. Out target is now expanding to the photochemistry of the photo-functional molecules. 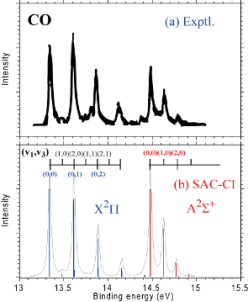 As an example, the figure compares the experimental spectrum with the SAC-CI theoretical one including the thermal effect of the internal bond rotation. Symmetry-Resolved Vibrational Spectra of Carbon K-shell Photoelectron Satellites in Carbon Monoxide: Experiment and Theory, K. Ueda, M. Hoshino, T. Tanaka, M. Kitajima, H. Tanaka, A. De Fanis, Y. Tamenori, M. Ehara, F. Oyagi, K. Kuramoto, H. Nakatsuji, Phys. Rev. Lett., 94, 243004 1-4 (2005). C1s and O1s photoelectron satellite spectra of CO with the symmetry-dependent vibrational excitations, M. Ehara, K. Kuramoto, H. Nakatsuji, M. Hoshino, T. Tanaka, M. Kitajima, H. Tanaka, Y. Tamenori, A. De Fanis, K. Ueda, J. Chem. Phys. 125, 114304-1-10 (2006). Electronic Circular Dichroism Spectrum of Uridine Studied by the SAC-CI method, S. Bureekaew, J. Hasegawa, H. Nakatsuji, Chem. Phys. Lett. 425, 367-371 (2006). Fine Theoretical Spectroscopy Using SAC-CI General-R Method: Outer- and Inner-Valence Ionization Spectra of N2O and HN3, M. Ehara, S. Yasuda and H. Nakatsuji, Z. Phys. Chem., 217, 161-176 (2003). Fine Theoretical Spectroscopy Using SAC-CI General-R Method: Outer- and Inner-Valance Ionization Spectra of CS2 and OCS, M. Ehara, M. Ishida, and H. Nakatsuji, J. Chem. Phys., 117, 3248-3255 (2002). Electronic Excitation Spectra of Furan and Pyrolle: Revisited by the SAC-CI Method, J. Wan, J. Meller, M. Hada, M. Ehara, and H. Nakatsuji, J. Chem. Phys., 113(18), 7853-7866 (2000). Hyperfine Splitting Constants Studied by the SAC-CI Method, H. Nakatsuji, M. Ehara, and T. Momose, J. Chem. Phys., 100(8), 5821-5828 (1994). Calculation of Hyperfine Splitting Constants with Slater-Type Cusp Basis by the SAC-CI Theory, H. Nakatsuji and M. Izawa, J. Chem. Phys., 91(9), 6205-6214 (1989).